All participants to this race are not admitted on the PRO Category. The race will be a time trial race from starting point to the banner at the end of the rapid. The best four athletes will compete in the final, that will consist in a heat of four paddlers, Boatercross style. This category is for young skillful athletes that are less than 21 years old. This paddlers will face themselves in the same slalom racecourse of the PRO Category, and in a boatercross and in a downriver time trial. If an athlete under the age of 18 will request to compete in the PRO Category, in the case he will be allowed to do the same by the organizers because of his obvious skills, he will not be part of the Under 18 PRO category anymore. Open to: the best 32 paddlers based on the slalom results (qualification run). Any kayak will be allowed for this race, in polyethylene and in fiber composite. The organizers can decide at any time not to allow a boat to run the race in case it is not in proper conditions. The race will consist of a qualification run (2 rounds, 45 seconds, both scores added), a semifinal run (2 rounds, 45 seconds, best score) and a final run (3 rounds, 45 seconds, best socre). The number of participants allowed to the semifinals will be decided based on the number of participants, on July 18th. For the final run the top 5 paddlers from semifinals will be selected. The points to the tricks will be given based on the ICF freestyle competition rules and regulations. Only the tricks considered in those rules and regulations will be considered. Competitors will be ranked according to their fastest run (best of two). The top 15 paddlers will then enter the final. The final will consist of one run down the course ranked by the fastest times. The paddler scoring the best time on the final run will be the winner of the Slalom race. The race consists in a time trial downriver descent through mandatory slalom gates, downstream gates being marked with green/white poles, upstream gates being marked with red/white. Athletes will have to cross a finishing line or touch with one hand the banner at the end of the race in order to finish or cross a sensor placed in the finishing line. 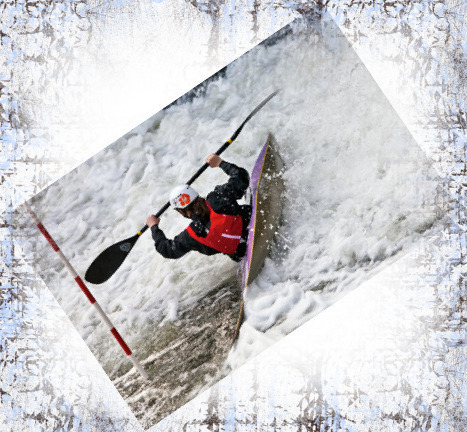 Penalties and gate negotiations will be judged according to the current ICF Slalom Rules. Touching one gate: 2 seconds penalty. Missing a gate: 50 seconds penalty. Any gate passed in the wrong direction will be considered as a missed gate. Keep your hands always on the paddle. You're not allowed to push people or kayaks with the hands. Keep your paddle away from other people body. Kayak – kayak contacts are allowed and it is possible to push someone offline by touching his/her kayak. If the judges will notice any athlete breaking these rules the same athlete can be disqualified from the boater cross race. The race consists in a time trial downriver descent. Athletes will have to cross a finishing line or touch with one hand the banner at the end of the race in order to finish or cross a sensor put in the finishing line. Athletes might be required to wear a GoPro camera in order to have additional time measurement. The race will consist of one qualification run (Head to head) and one final run. The best athletes of the qualification run will qualify for the second and final run. The two losers with the best timing from qualification will be admitted to finals as lucky losers. This is subject to change when the venue will be selected and the number of participants will be finalized. The winner of this race will be crowned as the Rapid Raja. "For Adventure@ Mechuka we will have an open championship as it is being organized for the first time." Every athlete can use only one boat for the slalom, boatercross and Raja Trophy races. Boat exchange will not be allowed. In case an athlete does not have a boat he has to inform the organizers at least 12 hours before the beginning of the first race, and the organizers will decide if the boat exchange is possible. Only for the freestyle race boat exchange will be possible. A category will be existing when at least 3 paddlers of the same are registered and are taking part to the race. Paddlers can compete in the pto races for Rapid Raja trophy even if the female pro category will not be formed. Only the first 3 competitors of a category will receive a prize. In the case of a category with only 3 competitors the third place prize will not be distributed unless the organizers will decide otherwise. Freestyle 100 points Slalom 100 points Boatercross 100 points Points will be given to the first 30 athletes of each specialty based on the chart below. with no constructional changes, apart from those offered and sold by the manufacturer and provided that these changes do not impact the safety standards. Handles, full plate footrests and pillars must not be removed! Points will be given to the first 30 athletes of each specialty based on the chart below.